Lions are the only big cat that prefer to live in social groups. These social groups, or prides, can be as small as 3 or as big as 40 animals and consist of related females and one to three males. Within pride, lions can be very affectionate with each other and love to touch, lick, and rub on pridemates. The primary responsibility of the male within the pride is protection, while the female is responsible for the hunting and care-giving. In the wild, a lion’s diet consists mainly of larger plains animals, including zebras, buffalo, impala, and wildebeest, though they will munch on smaller prey such as rodents and tortoises. A hunt is a cooperative effort, with the females doing the majority of the hunting with a little help from the males. After the prey is brought down, the males in the pride always eat first, with the females going next, then lastly the cubs. A typical meal for an adult male lion is 15 pounds (7 kilograms) of meat, though lions can consume as much as 60 pounds (27 kilograms) at a sitting. Lions will also scavenge kills from other carnivores like hyenas. 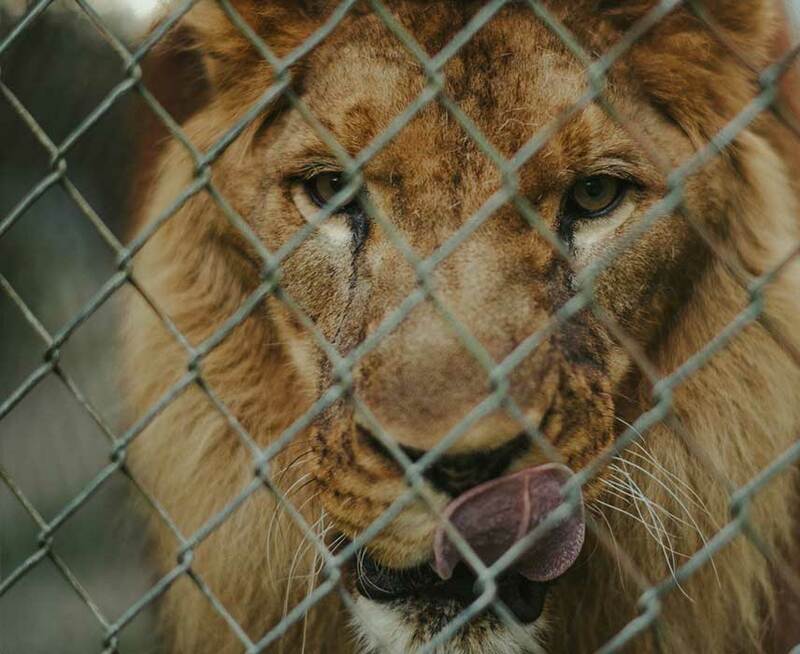 At Catty Shack, our lions eat roughly 10 -15 pounds of food five to six nights a week. The Catty Shack Ranch follows the USDA guidelines and feeds according to their body weight. They also follow strict nutrition requirements from their veterinarians and also add vitamins and minerals to all their food. Their menu is primarily chicken and red meat. Catty shack only feeds processed meats, never live. Lions can grow up to 10 feet in length from nose to tail base and can grow up to four feet in height. Females will typically weigh 200 to 400 pounds, while the males can weigh anywhere between 300 and 600 pounds. At Catty Shack, the weight of our lions is strictly monitored to ensure that our residents maintain a healthy weight. Lions used to range from parts of Europe and Asia through most of Africa but today they are found mostly in Saharan Africa; however, there is a small population of lions located in the dry Gir Forest of northwest India (known as Asian lions). Lions inhabit a wide range of habitats, including open plains, thick brush, and dry thorn forest. Contrary to their common nickname “King of the Jungle,” these animals do not inhabit forested areas. Population estimations for African lions are around 21,000 individuals, which is roughly half the population estimated in 1950. The Asian lion is estimated at less than 300 individuals. The African lion is listed as a vulnerable species, while the Asian lion is endangered. Habitat destruction and encroachment of humans is a real threat to these animals, along with distemper, which is a disease passed on to them from dogs in nearby villages. Hunting of these animals also exists, especially near farming communities. Mating can occur throughout the year when the female is receptive. Females give birth to one to six cubs after a gestation of about three and a half months. The cubs will nurse for about six months and will supplement that diet with meat starting at three months of age. Female lions usually give birth to a litter every two years, but sadly 60-70% of lion cubs will die within their first two years of life. Female cubs will stay in their mothers pride for life unless there is not enough food to support them, in which case they will leave the pride. Young males leave their mother’s pride when they grow large enough to become a threat to the dominant males. Young males leaving the pride will often join together with other related males (brothers/cousins) from their former pride and search for a pride to take over. Dominant males lead a pride for an average of three years before being ousted by younger males. Once a new male takes over, he usually kills all of the cubs within the pride. This is so as not to waste resources on cubs that are not genetically linked to him, as well as to spur the females into heat so he can mate with them to produce his own cubs. A male lion’s mane helps them to look more fierce and can help protect their throats while in battles with other males. Manes will grow darker with age, turning from a bright golden color as a young lion to almost black as an older adult.When lions walk, their heels don’t touch the ground. A lion’s roar can be heard as far as 5 miles away! Lions begin roaring at around 2 years old. A lion’s tail is tasselled (otherwise known as a puff-ball! ), which can be used to send signals to other lions, including directional messages during hunts and flirtatious messages for mating. A lions claws can reach lengths of up to 1 1/2 inches from the base to tip. Lions love to sleep! In fact, they sleep up to 20 hours per day! Lions and tigers are so similar in body size, structure, and composition, that without their skin it would take an expert to tell these two species apart!